Liberation War Affairs Minister AKM Mozammel Huq has said the name of Ziaur Rahman will be removed from the nameplate of the Shishu Park at Shahbagh in the city in a week. 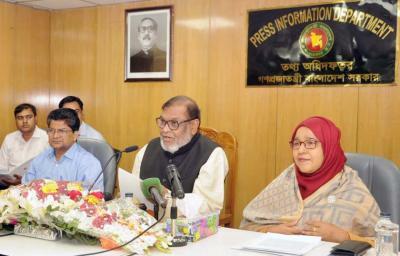 "The 'Zia Shishu Park' has already been renamed as 'Shishu Park' and the nameplate will be changed within a week," he told a press conference on the programmes of the Genocide Day on March 25 and the Independence Day on March 26 in the PID conference room in the city. He said a memorial monument will also be built at the Suhrawardy Udyan where the Pakistani occupation forces surrendered in 1971. The place where the Pakistani occupation forces surrendered had been turned into the Shisu Park by former President Ziaur Rahman, he added, reports BSS. Huq, however, said the Independence Day will be observed with a different dimension and a one-minute 'blackout programme' will be observed throughout the country from 9pm on March 25. Asked if whether freedom fighters' grandchildren will get the 'quota privilege', the minister said it will depend on the government decision. About the freedom fighters' list, he said a complete list of the freedom fighters would be published during the present tenure of the government after further scrutiny. Liberation War Affairs Secretary Aporup Chowdhury, Principal Information Officer (PIO) Kamrunnahar, among others, attended the press conference.